Love Your Pumpkin Lattes? Try Pumpkin In Your Beauty Products! Pumpkin seems to be the prevailing flavor of the season — pumpkin pies, muffins, savory dishes and of course pumpkin spiced lattes! 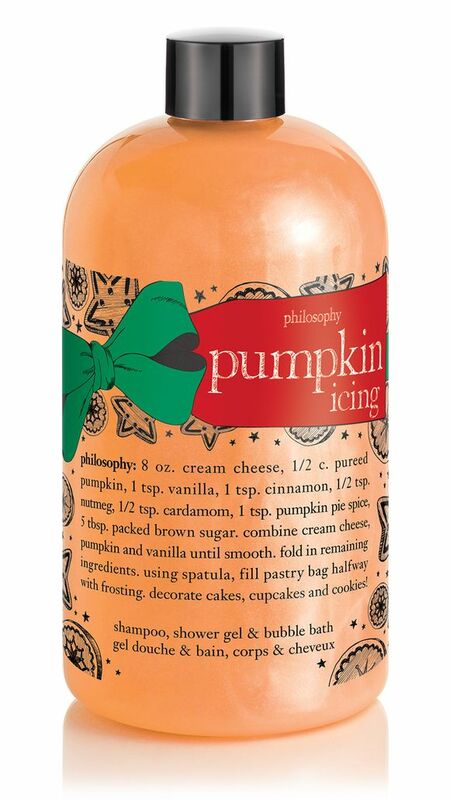 Philosophy Pumpkin Icing Shampoo, Shower Gel & Bubble Bath ($18 for 16oz) — rich, warm and decadently delicious, pumpkin icing satisfies your sweet tooth and lifts your spirits. indulge this season with a multi-tasking formula that delivers a rich, foaming lather to gently cleanse and condition, leaving skin and hair feeling soft. What I think: I love the sweet, pumpkin-y scent of this product! I like to use it when I take a bath, because it gives thick, rich bubbles. I have shampooed my hair with it, too, and it leave my hair very soft! 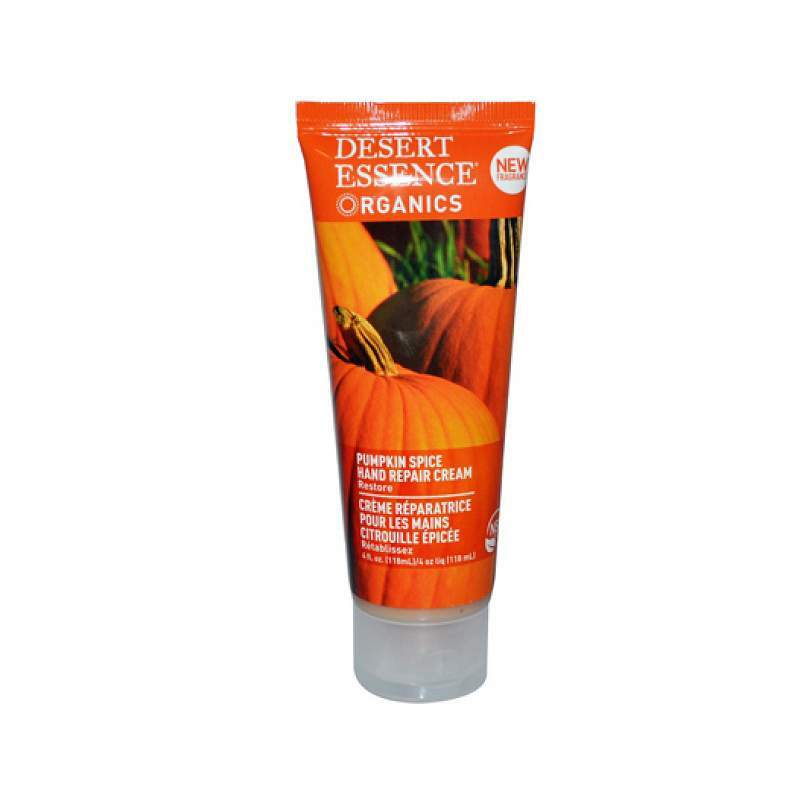 Desert Essence Pumpkin Spice Hand Repair Cream ($8.99 USD) — A high concentration of organic oils and extracts provide intense moisture to the skin and aid in the repair process. Organic Jojoba Oil, similar in structure to our skin’s oils, deeply penetrates the skin, leaving it soft and supple. Organic Pumpkin Seed Oil, with high levels of Vitamins A, C, E, and K, plus zinc, helps combat daily environmental stress on the hands. A proprietary blend of Organic Pumpkin Seed and Licorice Leaf Extracts helps to even skin tone and fade the appearance of age spots on the hands. Certified to NSF Organic Standard. What I think: This muted orange colored hand cream is so moisturizing. It has a spicy (not sweet), natural pumpkin fragrance. I love that it is organic and all natural. Perfect to help hands stay hydrated during the cold season. Good Earth Beauty Spiced Pumpkin Brulee ($22 USD) — Starts off with top notes of sweet, creamy pumpkin cake batter, mixed with an underlying rich vanilla caramel, ending with hints of spice. ..35 oz roller bottle. Mod perfumes are highly concentrated (they contain no diluting agents like alcohol or water) You only need to use a small amount – it should last throughout the day. Vegan, organic, cruely free and gluten free. 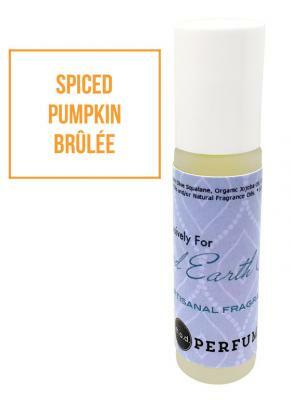 What I think: If you are looking for a sweet, pumpkin scent, try this natural perfume. 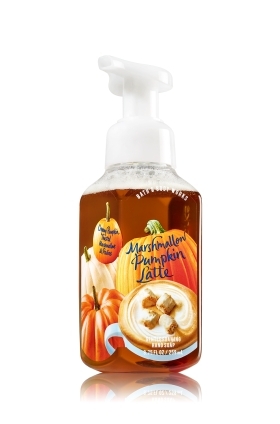 Bath and Body Works Marshmallow Pumpkin Latte Gentle Foaming Hand Soap ($6.50 USD) — The Gentle Foaming Hand Soap Delivers a cloud of luxurious foam that transforms into a rich, creamy lather to gently wash away dirt and germs, while soothing Aloe and nourishing Vitamin E leaves hands feeling soft, smooth and lightly scented with creamy pumpkin, toasted marshmallows and praline. What I think: I love purchasing Bath and Body Works hand soaps once a season. They have tons of great Fall (and Winter) scents, and that means many different pumpkin soaps! I like this one because it is sweet and creamy — you can smell the pumpkin, coffee and even the marshmallow! I keep this one in my bathroom! Don’t forget to check out their sales, I always try to get my soaps on the 5 for $18 sales, but they are usually 4 for $15, which is a great deal, too. Do you like the scent of pumpkin? If so, which products are you loving? Leave a comment and let me know! Previous postBeauty Products For a Spooky Halloween! Next postNew Skincare: Get Your Skin Ready For The Cold November Air!